Left over dreams and the righting on the wall. A look at Campaign '96 in Santa Cruz County. 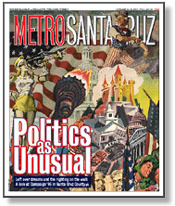 Endorsements: Metro Santa Cruz's opinions on national and local elections. Fisticuffs in The 15th: An acrimonious state Senate race pits the only Republican who could possibly win against the only Demo who could possibly lose. Only in Santa Cruz: A socialist-leaning, Marxist-lecturing, draft-card burning, folk-song singin' mayor finds himself designated "fascist pig" by City Hall protestors. Do or Die: 2nd District Supe race will decide board's majority. Davis and Keeliath: Republican long shot chases after Demo favorite in 27th Assembly District race. Show of Willy Power: Post-modern rockers from Chicago raise the rafters with their aggressive punk-inspired hillbilly--just don't call it rockabilly. Altared States: Passion, danger and tenderness merge in eloquent statements on Latino experience. Heals Belles: 'Through the Veil' follows one woman's cycle of spiritual death and renewal. In the Mood Indigo: An appealing new bistro charms its East Cliff neighborhood with stylish atmosphere, friendly staff and promising, vivacious menu.